Working in a shop with poor lighting can be dangerous, and make the shop seem dreary. 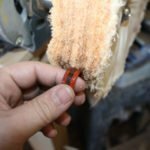 It can also make the shop feel constricted. 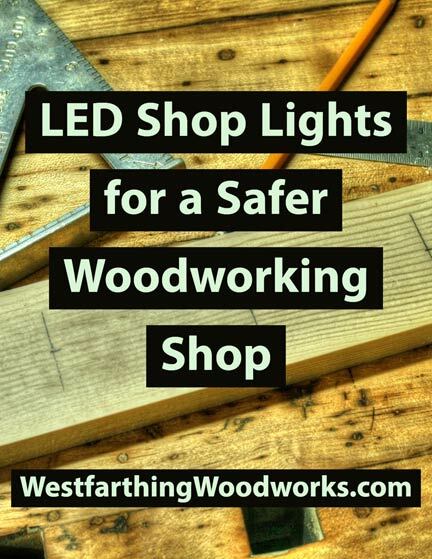 When you use LED shop lights, you create a safer woodworking shop and can even make the place feel bigger. Many times people think about their shop lighting after everything else, or they neglect to install good lighting at all. This is common in garages where there are not as many outlets, and it can be hard to get good lighting into the space. 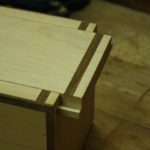 Instead of looking for options, most woodworkers just open the garage door for extra light, or they work under mobile lights. This is a good temporary solution, but it is not as good as running permanent lights. Now that LED lights are not as novel as they once were, the price has come down a lot. 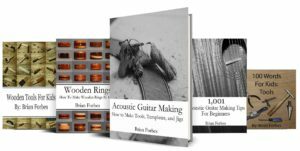 You can find a lot of manufacturers that have different offerings, and the competition between them has driven the price very low. LED lights have been around for a long time, but they are finally available for consumer use in a way that does not break the bank. A simple online search can show you a lot of options that can fit any budget. One of the best places to find these is on Amazon, which is where I bought my lights. 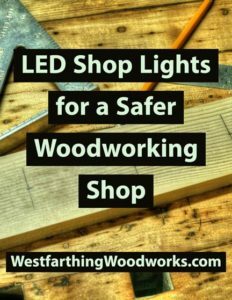 Adding lights is just one of my 29 Ways to Maximize Your Woodworking Shop Layout. In the post, there are several other ways that you can make your small shop feel bigger, lighting is just one of them. Mine look like long single bulb fluorescent lights, and most people can’t tell the difference until you turn them on. They came eight in a box, with all the connectors and everything I needed to hang them. The price was great too, and it made my shop super bright. It’s an odd thing, but lighting actually increases space. It does not change the physical dimensions of the room, but it makes the room feel bigger. Dimly lit areas feel confining, where as brightly lit areas feel more open. If you have a small shop, you can do a lot for the area with just some improvements to the lighting. Adding in LED lights in key areas can brighten the look, and make the work shop feel bigger than it really is. 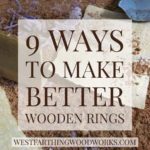 Also, since they are so inexpensive, you can add several of them without spending a ton. Once you start working in a brightly lit space, you will feel the difference. Not only will the area feel bigger it will be easier to do things. You will not feel as frustrated, and you will give yourself a chance to catch things that you could miss under low light. 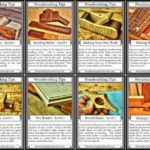 For more woodworking tips, take a look at 52 Printable Woodworking Tips Cards, which is a fun way to learn about woodworking. It’s safer to have better lighting, because you will see more of what is happening and have a better chance of catching something before it can harm you. It’s not a substitute for any kind of protective gear obviously, but the more you see the safer you are. A dimly lit area makes it hard to see what is really going on. 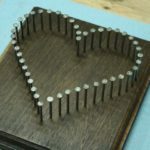 For example, you might not notice a small nail in a piece of wood before sending it through the planer in a dim environment. When you send it through, it can ruin the blades and even fire the nail out of the machine. A well lit area makes it easy for you to see your project, and makes it easier to identify problems before they become safety issues. LED lights in general are super bright, so they reveal a lot more than even standard house lighting does. 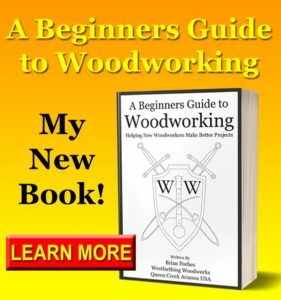 I talk about safety in A Beginners Guide to Woodworking. This is an important subject, and you owe it to yourself to learn as much as you can about keeping yourself safe. There is nothing like making a huge mistake because you didn’t see something. I had this happen to me when I was staining a piece for my wife. I was using purple stain under flourescent lights, and no matter what I did, the color looked blue. At the time, I was using a dye stain, and I didn’t mix it myself, it was purple right from the manufacturer. I ended up adding several coats because in the dim flourescent light, the color looked blue no matter what I did. When I finally got the piece inside the house, it exploded with deep purple tones, and it was a lot darker than I really wanted. This was due to the several coats I applied thinking it would kill the blue color. Long story short, if I was more invested in my lighting, I would have seen the color for what it really was, and not created a piece that looked like it was dipped in purple dye for a week. Lesson learned, and now I have much better lighting. Your homework is to at least look up some LED shop lights on Amazon and see what is available in the market. If you have made it this far in my post, you obviously have some issue with your lighting that you want to change. LED lights might be that change. I use Amazon all the time, and I am very comfortable with them. That is why I recommend that you also try them out. This is the link to the exact lights I bought, and they are awesome. I tried taking picture of them for this post, but every time I try the camera adjusts so the pictures really don’t show the true brightness. Become familiar with what is available, and then when you are ready at least you already have all the information about LED that you need. If you want to look at other option you can, and it will be easy to compare to the LED specs. Better lighting in the shop can have a huge impact on the look and the feel of a small shop. Good lighting makes a small shop feel bigger, and makes it easier to see things. This translates into less frustration, and better projects. A dim shop is a burden to work in, and a safety risk. It can cause you to make mistakes, and possibly injure yourself. This is no way to work, especially when the solution to your lighting problems is most likely less than $100. Check out Amazon for their LED shop lights, and you will be amazed at the range of products and systems. Pick something that you like, and then start making your shop as comfortable and inviting as it should be.